HEY, YOU GUUUUYS! Nordstrom’s Half Yearly Sale launched this morning!!! Take up to 40% off pretty much everything on the site. I’ll be back this weekend with some of my faves from the sale, but in the meantime… shop it here! Now back to your regularly scheduled programming! I’m not sure if you know this, but Sunday is my favorite day of the week. It’s a day I like to reserve for organizing and preparing for the week ahead. Whether that be working on blog posts for The Style Scribe, doing laundry, running errands, making to-do lists, or booking upcoming travel, I always make sure to fit as much in on Sunday as I can so I can get through the week a little more stress-free. In addition to those things, going to church is another way I like to start my week anew. It helps to put the prior week in the backseat and really focus on what’s now and what’s next. When I am home, I go to HPUMC in Dallas and always try to attend a service where Paul Rasmussen is leading. He talks about scripture in a realistic and practical way that not only makes sense to me, but also makes it easy to apply to my everyday life. Going to church also gives me an excuse to get dressed up. During the week, you can often find me in my workout clothes – running from PureBarre to errands or to my desk. Unless I have meetings during the week, Sunday is really the only morning I have to get dressed with a purpose. This dress has been a good go-to for church this season and other times when I need something demure and sophisticated to wear (like to a luncheon or shower). Shoshanna makes amazing party dresses as well (loving this one, this one and this one! ), but she keeps the cuts relatively modest in terms of hem length and necklines. If you’re looking for longer pieces, check out this printed chiffon dress and this lace one. I must admit it’s been difficult to make it to church while I’ve been traveling so much. With that said, I would love some travel-friendly devotionals to take with me on my adventures. Do you guys have any recommendations? Would love to hear what you’ve been reading! What a pretty dress and love the fit. Productive Sundays are the best start to a week! That dress is so pretty, I love the pleated detail at the bottom! Lovee your dress! The print is gorgeous! 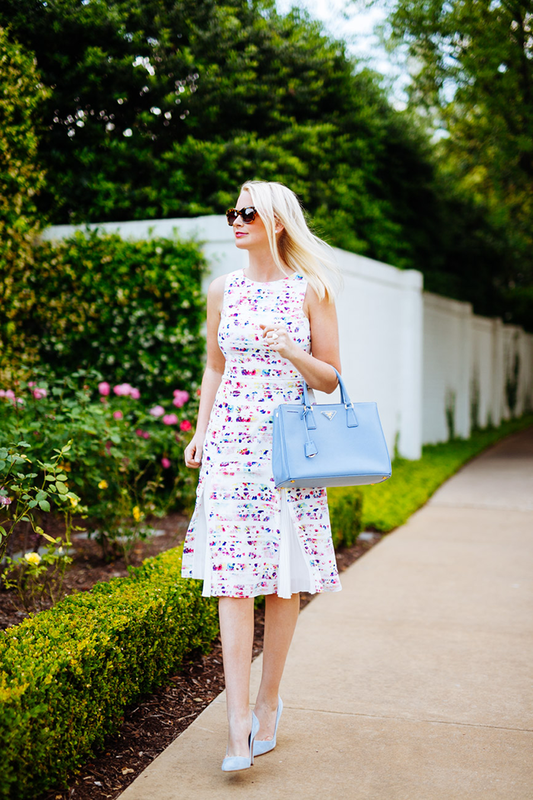 Such a pretty spring dress and I am obsessed with those blue shoes! Love this colorful dress. Perfect Sunday look! I also like to use Sunday to prepare for the coming week . . . and do everything I didn’t get around to doing Saturday. this is such a beautiful look! love the shoes! i agree with you about paul rasmussen…he is awesome!!!! This dress print is everything, not surprised to see it’s Shoshanna- I love their dresses! And the icy blue accents work so well! This is such a great idea for a post. As a Christian myself, I love hearing about other people’s Sunday routines. And I agree, it is so tough to get out to a good Church when you’re travelling. I look forward to hearing other people’s responses about the travel devotionals. Lovely Sunday best outfit too! What a beauty! This dress fits you like a glove and it’s beautiful! I love Sundays for this reason too! Church is always part of our week, and although we can be casual, I love a reason to get dressed up. Your dress is so pretty! Perfect for spring with those gorgeous heels. Gorgeous look! That dress is so feminine and flattering and I love the pops of blue from your bag and shoes! I’m swooning over this dress and I almost never wear color. Wow, so so gorgeous. There is something about this look that I adore. You look amazing. I visited some blogs today and I can say with a hand on my heart this is the most beautiful dress I saw today. It’s lovely and it looks good on you. Legs for days! Such a lovely dress.